Large windows fill the bedroom with sunlight. A Sputnik pendant and Tulip chairs in the dining area. 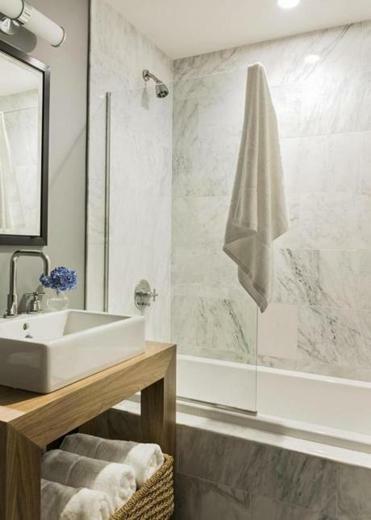 It was a tall order to transform the décor of this one-bedroom condominium from pink shabby chic into a modern bachelor pad, but Boston interior designer Jennifer Glickman was up to the task. 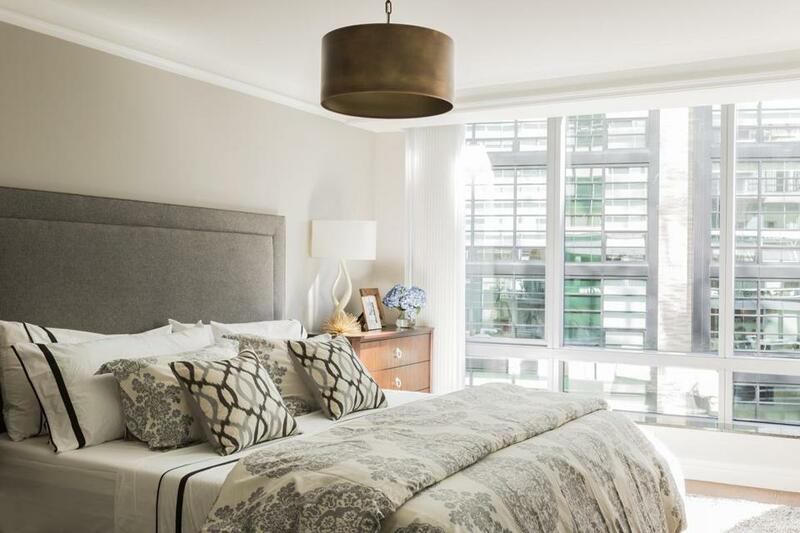 The one-bedroom home located in the Ritz Carlton Residences hadn’t been renovated in almost 15 years, and Glickman called for an overhaul of the entire unit. The unmatched floors were replaced with dark wood in a matte finish; the kitchen and bathrooms were gutted; and the rosy palette was washed away in favor of a neutral scheme centered on gray, white, and black. The home is now masculine, inviting, and easy to maintain. A glass partition in the master bathroom. Initially, Glickman had hoped to take down the wall separating the kitchen and dining area, which is part of the living room. “The wall concealed necessary plumbing, so we couldn’t do that,” says Glickman. She opted to set up a bar along the wall that the homeowner uses when entertaining. “We created multiple areas to make the space feel larger.” The sleek chrome Sputnik pendant adds contemporary flair; the classic mod-style Tulip chairs from Design Within Reach have custom seat pads upholstered with a black pattern. Floor-to-ceiling windows fill the bedroom with abundant sunlight. For when it’s too bright, Glickman had blinds installed that can be shut completely or partially to filter in some light. A copper Restoration Hardware pendant serves as a focal point and introduces another textural layer. Along with the upholstered headboard, the bedding — a blend of gray, white, and black patterns — is plush. Glickman made the slight master bathroom feel more spacious by installing a partial glass shower partition. “It maintains an open feel, but you aren’t at risk of getting the floor wet,” she says. Marble was used on the floor and shower walls and the room’s walls are painted a gray that echoes the veining in the marble. The square sink fits on top of the Lacava vanity which feels like a piece of furniture with open shelves and a beautiful walnut finish.